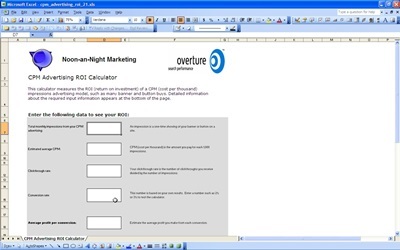 Save money with CPM Advertising ROI templates; avoid the need for sales staff to beat the pavement. Reach the audience through Web travel and accumulate clicks that earn you money. Free templates allow companies to set up programs to take advantage of CPM for advertising. Advertising is the best way to reach the public. Tell the world about the things your company has to offer. Templates offer a major return on your investment. Reach people and companies with powerful templates you might miss through average advertising. Maximize your investment with this profitable solution for advertising and get the best return on your investment.